Andrew Neiman (Miles Teller) sits at his drum skit in a practice room at the Shaffer Conservatory of Music. A first-year jazz drummer at the (fictional) best music school in the United States, Andrew is solitary, friendless, and driven to succeed by overwhelming effort and dedication to his chosen craft. His solitude is marked visually by his fellow freshman, director Damien Chazelle: he strikes the skins and strokes the cymbals inside the frame of an open door as the camera creeps towards him along a moodily-lit corridor. But the camera is not an omniscient observer, nor is it the voyeuristic audience. It is revealed to be Shaffer instructor Terence Fletcher (J.K. Simmons), stalking unannounced into the rehearsal room to assess Andrew’s potential. There’s a horror-suspense element to this initial scene of Chazelle’s electric Whiplash that he will often return to in colouring the tone of his film. Simmons as Fletcher is indeed like a villain out of a slasher flick transplanted onto the body of an eminent Manhattan music academy conductor. He wields his powerful personality like a machete and hurls the abusive verbal volleys of an army drill sergeant at his band if they dare to waver in their performances. Working his expressive brow below a cruelly bald skull, his head is a furrowed, rocky field in which nothing will grow. The skin of Simmons’ neck and bulky arms stretches into black turtlenecks like that of a snake about to shed, and Fletcher is a kind of jazz cobra, slinking elegantly to a beat all his own before rearing back for the deadly strike. Fletcher is already striking in his first meeting with Andrew, and doesn’t let up even as he recognizes the young drummer’s talent and invites him into his prestigious and highly competitive studio band. He asks the young man about his family (disappointing high-school teacher father, abandoned by his mother) and chats jazz influences with him (the famous, tumultuous drummer Buddy Rich is a major touchstone), then gives him some initial praise in the rehearsal space. But it’s all a psychological trap, the nectar to draw the naive Andrew into the man-eating jaws of his searing anger. Fletcher unloads on Andrew when his timekeeping does not conform to a standard so minutely exacting as to be possibly arbitrary, screaming, insulting, throwing a chair at, and even slapping his new drummer until the boy is reduced to tears. Andrew is not broken by the fiery crucible of this intense tutelage, which Fletcher believes, with the zealous certainty of the niche culture fanatic, to be absolutely necessary to maximizing talent and potential in jazz. Instead, the capable but soft Andrew is reforged into a harder iron instrument; Neiman is a new man, and Teller ably embodies both ends of this spectrum. He shrugs aside the laddish bonding with his father (Paul Reiser), clashes with his football-star family rivals at a holiday dinner about the nature and cost of success, and breaks it off with his pretty but modest and unambitious girlfriend (Melissa Benoist), telling her with cold, prickish rationality that she will hold him back and they will resent each other bitterly for staying together. The lengths to which he will go to excel under Fletcher’s eye become ever more extreme and more physically and psychologically taxing. His overworked hands become bloodied with regularity, the plasma dripping from his sticks, splattering his skins, and beading alongside the condensation on his cymbals. Chazelle visualizes Andrew’s blood-oath with Fletcher’s absolutist philosophy of excellence with a striking shot of the drummer’s hand plunging into an ice-water pitcher in slow motion. The transparency of the liquid element is gradually overcome by bloody crimson, just as Andrew’s more clear and casual personality is conquered by his bloody-minded pursuit of Fletcher’s approval. 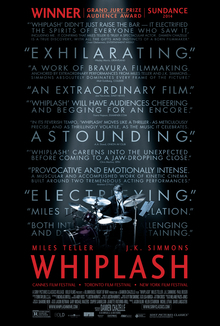 Whiplash is reminiscent in many ways of Darren Aronofsky’s Black Swan, another artistically uncompromising film about a young, cloistered performer in New York City driven by an emotionally unhealthy mentorship with a highly demanding teacher to greater aesthetic heights than they might have thought possible or prudent, regardless of the moral consequences or psychological toil. Both films focus on the corporeal viscera that underscores erstwhile tasteful high cultural forms and present climactic performance triumphs as carrying more ambivalent personal costs (or worse). But Black Swan‘s nightmarish, destabilizing fantasies (inheritances of Stanley Kubrick), which transform the simultaneous ascent and descent of Natalie Portman’s ballerina into a more baroque metaphor for the intersection of genius and madness, could not be supported in Whiplash. Chazelle’s film has Fletcher’s intensity and unwavering obstinance, and doesn’t require flights of fantasy; its version of reality is nightmarish enough. If Whiplash is a nightmare, then it’s a darkly appealing one. The film’s spectacular closing sequence, in which Andrew takes over a Carnegie Hall performance contrived by Fletcher to humiliate him with furious, virtuoso drumming, is a bravado showcase, tense and stunning. Editor Tom Cross’ quick, off-beat rhythmic cutting of the band’s performance sequences in general is an intentional alignment with the syncopated pulse of jazz that is self-evident but not unsuccessful. Indeed, especially in the finale, it lends an urgency and excitement to the scenes of performance that this particular jazz non-believer did not consider possible in this particular musical genre. But in the Carnegie performance in particular, Chazelle never lets the dazzling nature of the filmmaking bury the philosophical ambivalence of Andrew’s metamorphosis into an embryonic jazz great (even if the jazz in the film is, according to the New Yorker, not so great and underscored by a non-jazz-like solitary competitive aggression). If Whiplash is more of a horror movie than a music movie, then Andrew Neiman can only defeat the monster that is Terence Fletcher by becoming a greater monster himself. And since this was Fletcher’s mission all along, it is no victory at all.